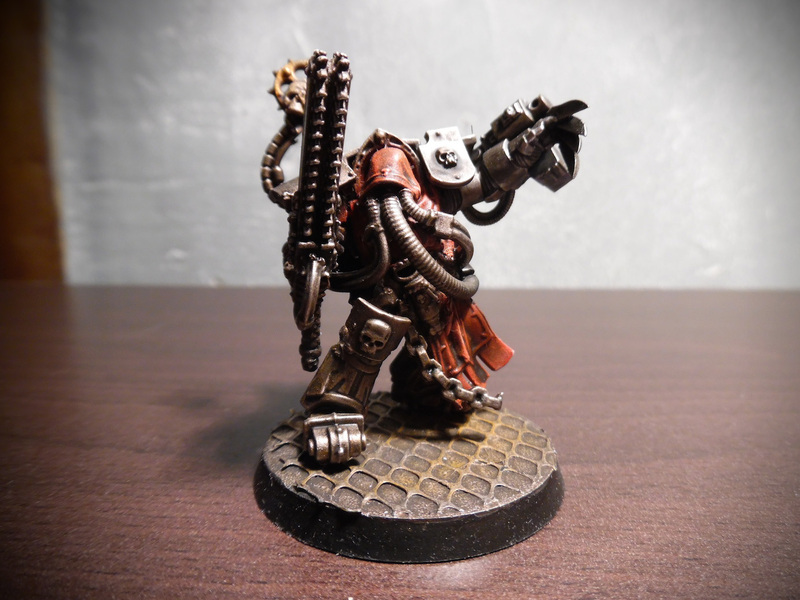 Time for another Invitational for the weekend – Strike Team from Ultracola. This is my Invitationnal Strike Force! A) Lukaz Chrom is a magos obviously inspired by Blanche. 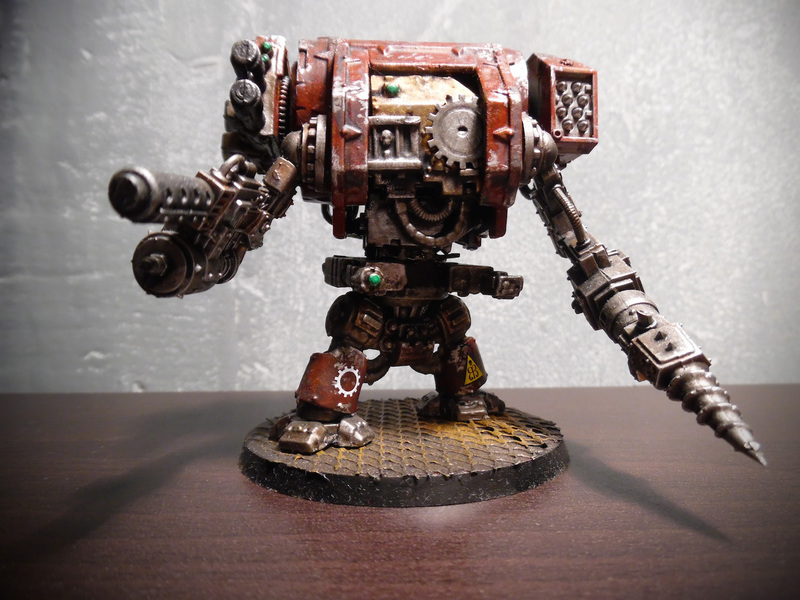 B) The big guy Delta 242 is an assault walker made with bits of Ork walker, Defiler and various Dreadnoughts. His design is a mix between Thrallax of the Heresy and later Dreads. I like to think Lukaz made this as a prototype for the Mechancum. 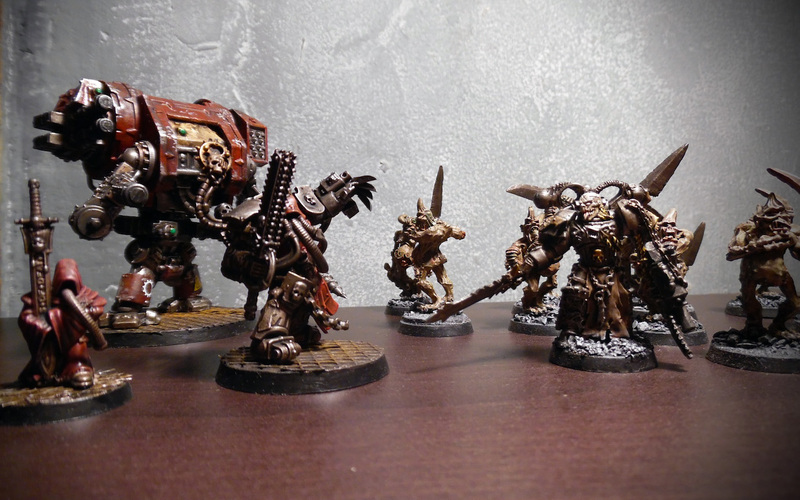 The Strike Force faces its enemies; demons led by an Iron Warrior minion of Big Daddy Nurgle! The little guy is on the far left. C) The little guy is kinda golem built/grown in a clone tank. He serves his master and bears an old artefact : the Swordkey. Lukaz looks for the device it’s made to open, or the data it can decipher. As a matter of fact when the Ripper-chainsword is not enough he uses it as a mighty energetic sword. So many giant walkers lately – I love it. Very cool!! 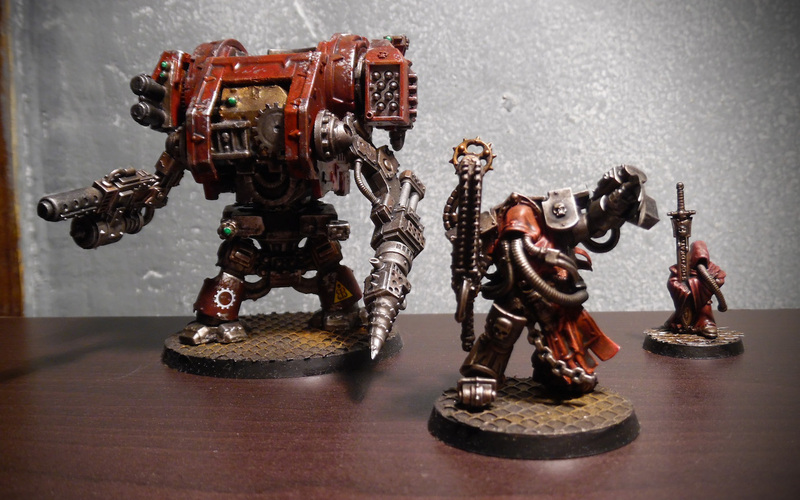 Lukas, you are going to have an absolute blast with the amazing new Mechanicus models! Thanx ! 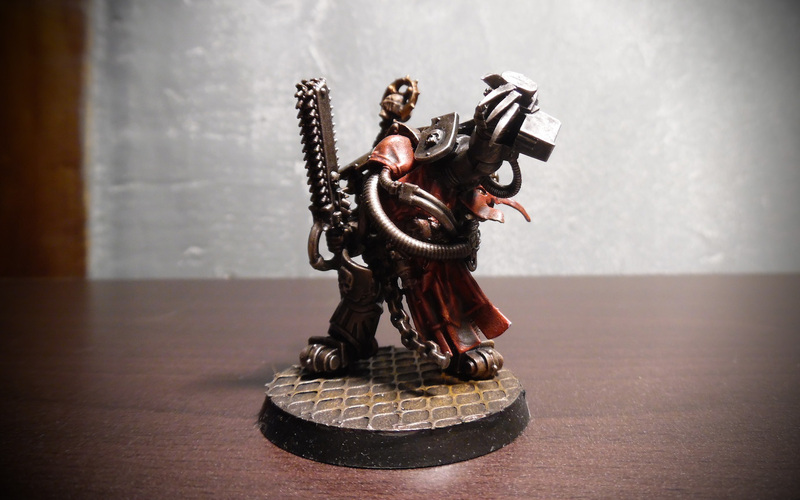 I’m a great fan of the Skitarii in the novels . Though they are very cool I don’t find the techno-barbaric feeling I expected ! We’ll have to put some furs, skulls, chains and swords ! For the Omnissiah ! Exactly! perfect material to play with. Very cool entry! I’m as is well documented a big fan of walkers and yours is definitely inspired. Very inpirating stuff…. Don’t you have a plog / blog ? I’d like to see more of your stuff. Kari had the courtesy to link my blog on the first page ! thanks buddy ! Awesome looking strike force! The Magos, Lukaz Chrom, is the highlight for me. I really like how his hood completely masks his face aside from the cables snaking outwards. It gives him a mysterious and powerful vibe. I love his left taloned hand; vicious! The reds on each of the models look really nice too, the color of dried blood. My only suggestion would be to either paint the holes in the barrels of Chrom’s stormbolter or alternatively drill them out. Great work all around. I hope to see others to bolster Chrom’s forces! 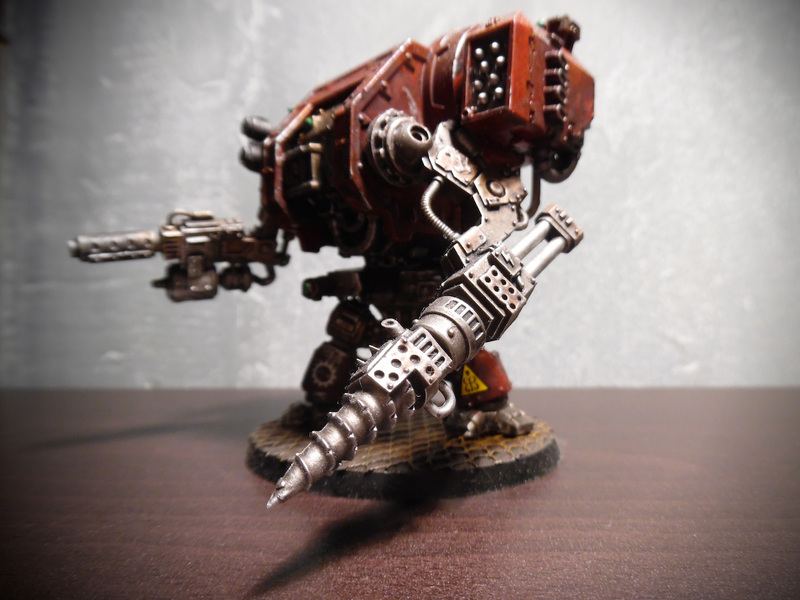 I really like the magos, a real Blanchistu feeling of a model, creepy and yet noble all at the same time.